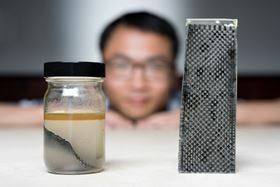 Kai Yu, a former postdoctoral researcher in The George W. Woodruff School of Mechanical Engineering at Georgia Tec, sits behind a piece of carbon fiber composite immersed in alcohol. (Credit: Rob Felt, Georgia Tech). Researchers at Georgia Institute of Technology have developed a method to recycle nearly 100% of the materials in certain types of thermoset carbon fiber composites. The new method involves soaking the composites in an alcohol solvent, which slowly dissolves the epoxy that binds and gives shape to the carbon fibers. Once dissolved, the carbon fibers and the epoxy can be separated and used in new applications. ‘This method we think could have a lot of immediate industrial applications, with lots economical and environment benefits,’ said Kai Yu, a postdoctoral researcher in The George W Woodruff School of Mechanical Engineering at Georgia Tech. Jerry Qi, a professor in the Woodruff School who leads a team of researchers affiliated with Georgia Tech’s Renewable Bioproducts Institute, said that traditional carbon fiber presented two challenges for recycling. ‘The polymer matrix is usually crosslinked, just like the rubber, and it can’t be simply melted; it’s very hard to strip away the polymer to reclaim the embedded carbon fibers, which are more valuable to recycle,’ he said. The study, which was sponsored by the National Science Foundation, National Natural Science Foundation of China, Singapore A*Star Public Sector Fund and the Singapore NRF-supported Digital Manufacturing and Design Centre(DManD), was published in the journal Advanced Functional Materials. This story uses material from Georgia Tech, with editorial changes made by Materials Today. The views expressed in this article do not necessarily represent those of Elsevier. ELG Carbon Fibre Ltd and Land Rover Ben Ainslie Racing (BAR) have formed a plan to help ensure that carbon fiber process waste is recycled.